I cut out gluten for about two months. It is really hard to do, especially if your diet is already very limited, which mine is. I was having some digestive problems and was eliminating foods to see what it might be. I was happy to find that it wasn't gluten. But I did discover that I can no longer eat beef. I wasn't eating much and only organic but my digestion is all well from eliminating all meats except organic chicken, some fish, and turkey bacon. I am mostly eating vegetarian now, lots of veggies, brown rice, yogurt, almonds, soymilk. It has made a world of difference. Good luck with your exercise class! and diet. Good luck!!! How great that you are doing that. Keep us posted! Oh my…these flowers…so very beautiful! Have a wonderful week! The flowers are 'old' but just beautiful. Good luck with your diet, I hope the results will be very good. Wish you a wonderful week! 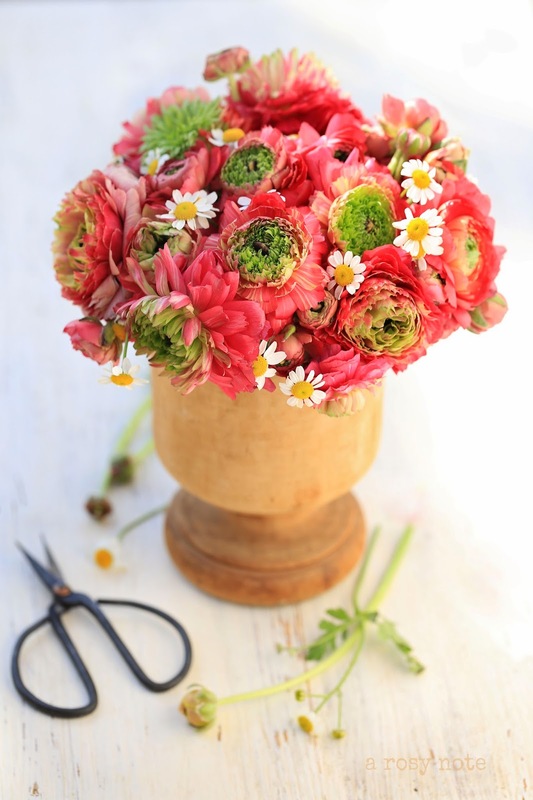 Beautiful photos–especially the ranunculus. I once almost fainted during a boot camp workout, so I take it slow now. Eating fresher, more locally grown foods has made me feel so much better. Lost 40 lbs 3 years ago and have kept it off. Best of luck to you! just being all around healthy. I hope you enjoy it! I just love your photos and those flowers are just gorgeous! I have been doing Weight Watchers for about 2 months now and I'm down 10 lbs.!! Good luck to you! The flowers and pears are gorgeous!! Gorgeous photography! I love the softness of your blog. I am contemplating changing my family's diet to gluten free. Keep us posted! Love all your pictures they are just gorgeous. I just recently started back to the gym and eating better. Good luck. Oh those pear photos are scrumptious!!! Your photography is breath taking! Honestly! Precioso el arreglo floral y espectaculares todas las fotografías !! 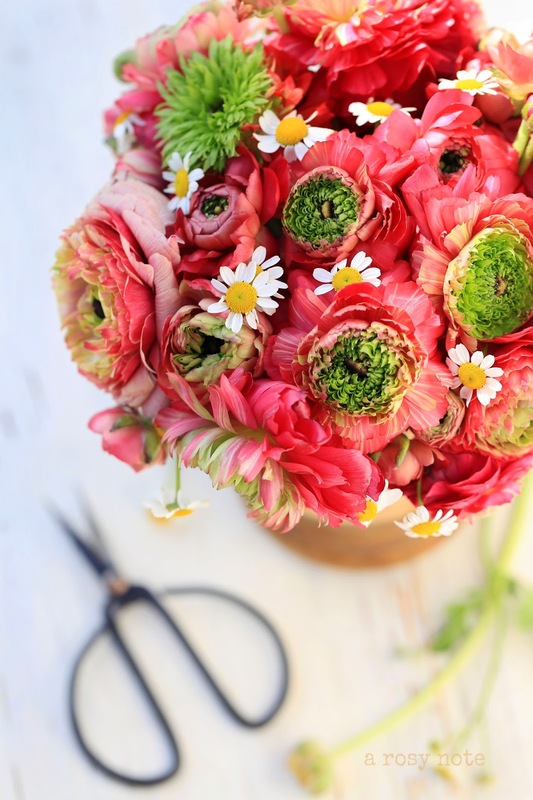 What amazing ranunculus, I have never seen them before and you totally captured their beauty. Good luck with your new exercise regime, I am a big fitness proponent ~ being fit really makes life better. Beautiful flowers! Wish you posted more. I miss you! I love your beautiful arrangements. I like the simplistic and natural style. Wonderful. gorgeous flowers! I have not seen those before. I love ranunculus. I wanted it for my bridal bouquet but was told the stems continue to grow after being cut so they don't make for good bouquets. I wish I had persevered and chose them anyways! Really beautiful photographs, Tricia, and you definitely have plenty of company when it comes to forgetting about photographs. I have some that are well over 3 years old! Stunning!! Absolutely breathtaking photos Tricia!! All of them!! I hope your doing well and have a lovely week! Fabulous photos of fabulous subjects! I've never seen a ranunculus in real-life….that I know of. These are truly fascinating. Good luck on your fitness crusade…I so need one! You have make beautiful pictures! I'm so happy to "see" you again. Lovely, lovely photos. Good for you on your new eating plan and exercise class. I'm thinking I need to try something new, some more targeted exercises for my "trouble spots". Visit you is alwys take a breath of beauty, darling friend. Beautiful the pears's images! I'm in diet too, less carbohydrates and sugar, and more movement. Surely I feel better. Good diet! 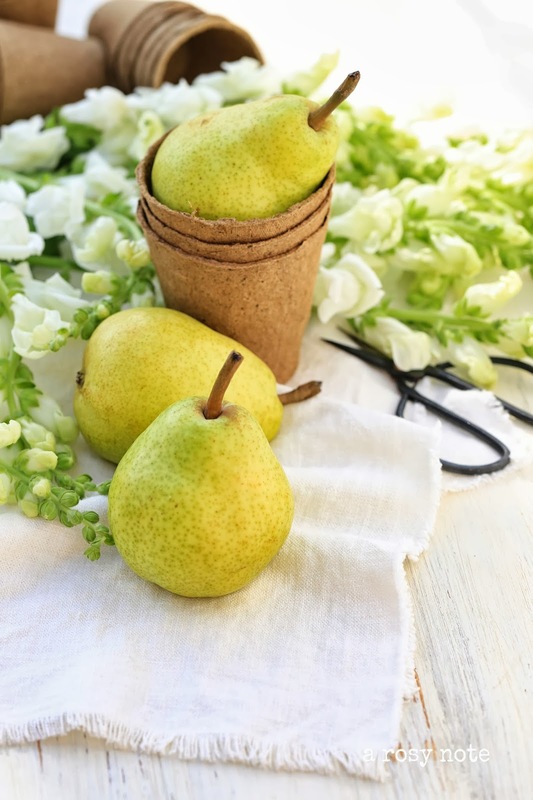 And these pears look so sweet! Your photos are beautiful – I feel as if I was start posts that way when I visit your blog. But, seriously they are so perfect. Good luck with the fitness class! These photographs are really gorgeous, wonderful and .. it doesn't matter if they date back to last Spring, their colours are perfect for wish to everybody a great Fall, believe me !! Have a lovely week and good luck with your fitness program, if you have perseverance, I'm sure the results will show themselves quite soon 😉 ! Tricia, your photos take my breath away! You have such an eye for styling and pick the prettiest subjects. 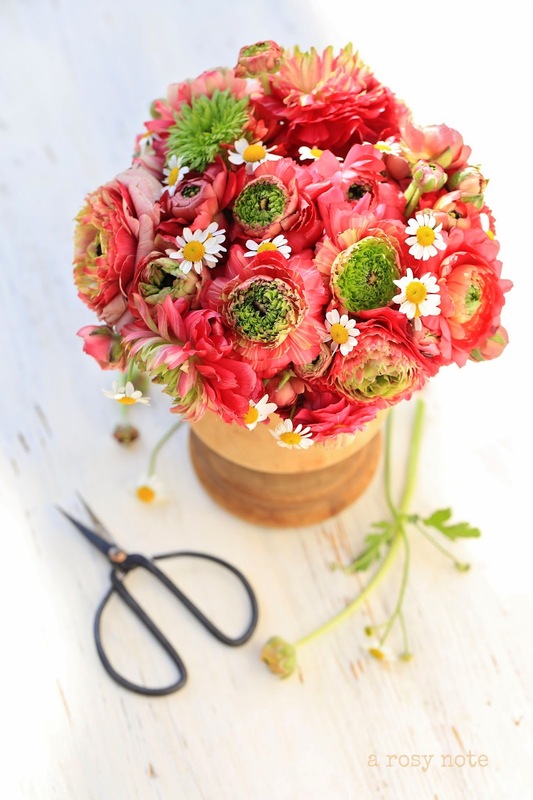 The ranunculus are beautiful, and they are the color of maple leaves in the fall. Our leaves are rapidly falling now, so I'm trying to spend as much time outside as I can before they're gone. I admire you for signing up for the exercise class. I'm forcing myself to get out and walk every day like I did when we had a dog. It's nothing compared to what you've got planned, but it's better than sitting on the couch! Happy fall and thanks for sharing your works of art! Such pretty flowers and of course your arrangement makes them even prettier Tricia. I know I should be getting healthier by doing the gluten free thing. Sugar has always been my downfall. Everyone that gets rid of gluten tells me how much better they feel. Good for you! And good for you doing this exercise intensive. Your courage is going to pay off in big ways. Thanks Tricia for stopping by my blog to see me. Made me so happy! Yay! You're going to feel amazing with your new fitness routine! And I do the same thing with photos… I'm sure there are many I've taken and forgotten about. Oops! These photos are beautiful, Tricia! Love how the ranunculus looks! 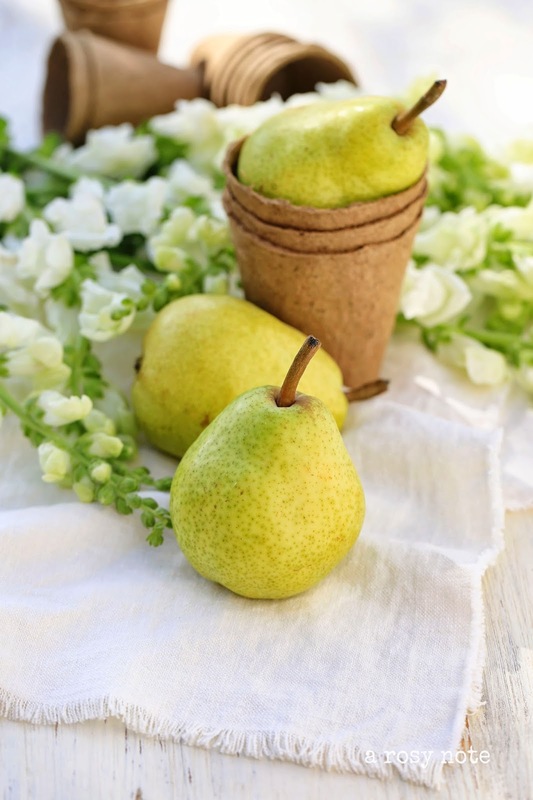 I've been gluten free for 3 years…maybe you could experiment with a gluten free flour, and use a natural fruit spread (no added sweeteners) to glaze the pears…you make me want to go bake! Happy Fall sweet Tricia!! WOW these images make me so happy and i am loving these bright beautiful colors!! So happy happy happy to see beautiful photos from you. Have a beautiful week and love to you! Hi Tricia! How can you possibly take photos like that and then forget about them??!! They are simply breathtaking. All the best with your new fitness routine – think of it as looking after your most important wealth – health! Lots of pretty photos here. And I do the same thing. I have tons of photos.. Way to many.. I wish you the best with your new work out plan. I would hate to take that before photo as well..
Gorgeous photos (as usual). I'm pleased you have shared them now. Beautiful colours. I trust the exercise classes will be more than reward you for any slight embarrassment. The end results will be worth it. Beautiful photos! Love your flowers! Here in Finland we have rain and still we have +10 degrees, warm autumn to be here in the north of Europe. Such gorgeous photos as always!! I do the same thing- photograph something and share it down the road. I am loving those ranunculus and the pears are beautiful too! Yes, time does fly – I can't believe it's already October, either! I love your photos – wonderful colours and compositions! I host a weekly link party called Seasonal Sundays. I'd love to have you link this week. Your images are always so full of light and fun!! Good luck on that class…you are a better woman than me for sure!! Hi Tricia, I would not have guessed these photos are from April, they are perfect for the end of summer and early autumn. As always, they are beautiful images! I admire you for embarking on a fitness course. Quite wise to do it before the holidays. 🙂 Wishing you great success with it. And thanks, as always, for stopping by. Love hearing from you. Good luck with your exercise class ! I think you take absolutely the most beautiful photos! Those flowers are gorgeous, Tricia! You've photographed them so beautifully too. Good luck with your fitness class! Such beauty! Your photos are just stunning! Good luck with the exercise, I need to be there with you! Hellooooo…came to have a peek at your beautiful photos again! Have a beautiful Sunday and love to you! so pretty, Tricia! You have given me a fresh idea for a wood urn that I have- very similar to the ones in these photos 🙂 I hope your fitness class is going well! The benefits will be great!! Your photography is inspiring and gorgeous, very glad I found you! Your work and styling always blows me away, it is always so inspirational. Gorgeous photography and fall colors. It 's all so soft and delicate .. It's always a pleasure to see your blog posts, they never disappoint and they always inspire! I hope you and your family are doing well. Wish I was a better blogger and posted more. Anyway, your photos are always lovely and I'm so glad that you are now on Instagram since I seem to find time to post there (as unfortunately I no longer have a working camera). certainly was NOT ready for! Love these gorgeous floral shots. you would have made that tart look! days, we'll do it for "real!" really meant a lot to me. Tricia, your flower shots are just stunning! Your site is like thumbing through a fine high end magazine! I enjoyed several posts and the photography is outstanding! Loved my visit here! SUCH gorgeous photos, Tricia. Thank you for sharing them with us!